A clean and minimal showcase theme that puts the focus on your work. 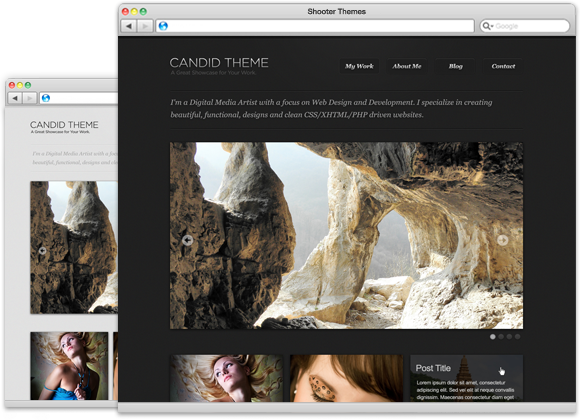 Candid is a theme that’s all about displaying your work. It puts your portfolio and only your portfolio up front, where it makes the most impact. All of our options are based off of the native WordPress admin design patterns. If you're familiar with changing settings in WordPress, you're familiar with changing the settings of your theme. No bloated custom configuration panels for you to figure out. We understand that some of our features may overlap with your favorite plugins. That's why we made sure you can turn off the extra features in your theme, so your plugin works like it should. Somebody likes your portfolio, now what? We make sure your visitors have an easy way to get ahold of you, and you have an easy way to enable a contact form. Google Analytics is a great way for you to see how much traffic your website is getting. We offer easy integration with Google Analytics to accurately track your traffic. Software is always changing. Once you purchase one of our themes, and install our Shooter Themes Manager plugin, you will receive notifications and be able to update your theme directly in your WordPress dashboard.